“For a long time I wished I could understand English better, until I accidentally heard about the Bible League literacy class in the social centre in our city. English was taught in such a systematic and easy way that I could easily understand. Now my son, Stanley, and I attend the Bible-based literacy program every Saturday morning, same time in different rooms. 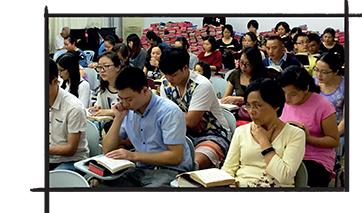 A seminary may seem like an unlikely place to teach Bible-based Literacy, but our partners in China realise that because of the low number of pastors available in churches throughout China, it may be a valuable skill to have in order to educate the nation with English and the gospel. The ratio of 1 pastor to 19 churches means that each of the seminary graduates will not only get to share the gospel with a keen and waiting congregation, but they will be highly in demand in terms of their skills and ability to teach Bible-based Literacy too. Over 2.3 million people are in prisons or detention centres in China. This is a significant percentage of the world total of over 10 million. As a result Bible League has been investigating opportunities with partners in prisons. Most other prisons worldwide conduct Project Philip as the program to reach inmates, however in China our research has shown that the Bible-based Literacy course will be the best method of engagement. Exciting News is that the Bible-based Literacy program has been introduced by one of the two Christian organisations involved with prison ministry. 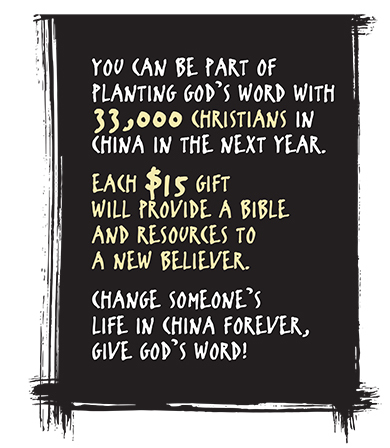 You can be a part of planting God’s Word with 33,000 Christians in China, in the next year. We serve the local church and other partners around the world by providing Bibles and Scripture resources for them to bring others into a right relationship with our Lord and Saviour Jesus Christ.